Consider this ad which appeared in the Ogdensburg Journal, Ogdensburg, NY on February 20, 1894. The same ad ran from January through September in that year. C.H. Evans, the Hudson, NY brewer I discussed earlier, had placed a similar ad in New York-area newspapers some years earlier. 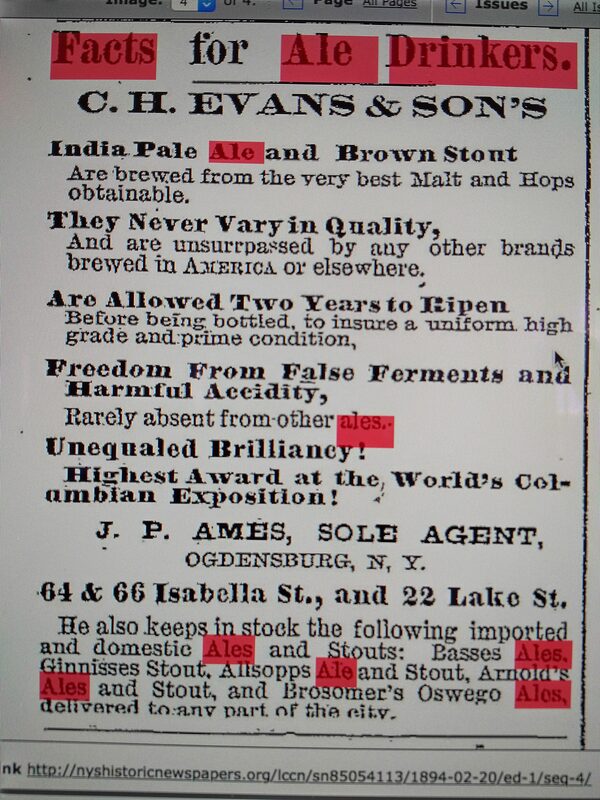 Evans probably helped J.P. Ames place the ads although numerous other brewers were mentioned. If Evans did pay the cost or part, it was commendable as competitive products were not excluded. In a two-part article in August this year I discussed the 1930s reminiscences of Walter Leonard, an ex-showman. After the Civil War his father owned a bar and hotel in Morley, near Canton in St. Lawrence County, the northern end of central New York where the St. Lawrence River divides the U.S. from Canada. Leonard recalled how ales were popular in the region and his father’s bar carried those of Greenway in the not-too-distant city of Syracuse, NY. Ogdensburg is the main city in St. Lawrence County. Potsdam is nearby and will prompt readers to recall WW II history, when a famous conference took place there at which the U.S. and Canada set their wartime strategy. The ale and porter heritage of New England and New York State has often been commented on. In recent writings I have reviewed many ads for these products and gleaned the names of many brewers (all now disappeared except for one or two). I am still struck by how long the tradition lasted. The lager deluge which saturated the Midwest and New York City and boroughs came later to central and northern New York, Vermont, New Hampshire and the “north country” in general. Ale and porter outsold lager in parts of the region until the dawn of Prohibition. 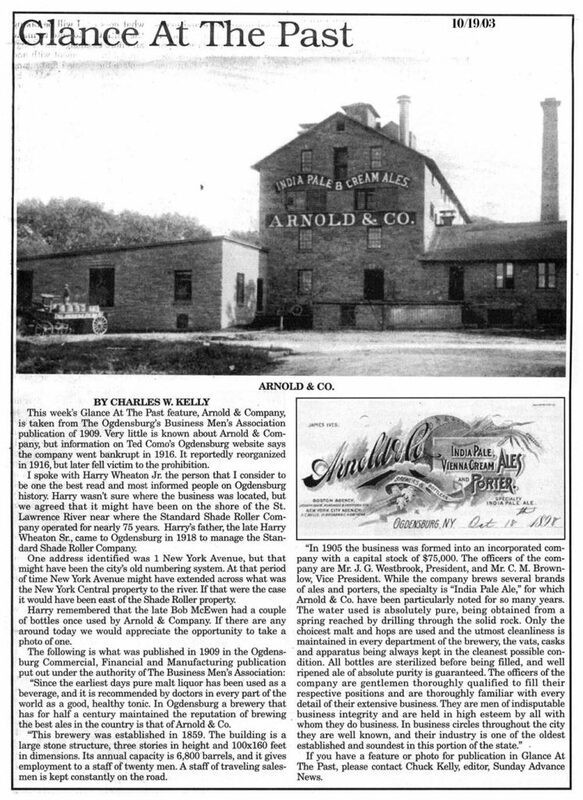 John Arnold, who had brewed in Ogdensburg, chronicled a good part of this history in his (1901) 100 Years Of Brewing. In 1894 J.P. Ames brought Evans’s ales from its downriver location on the Hudson, not a hard trip by the later 1800s. But look what else he sold: Bass’s ales, which meant the pale ale and the stronger Bass’ Burton ale, Allsopp’s pale ale, a renowned international pale ale and legend of the India trade, but also Arnold’s beers from Ogdensburg and even Brosomer’s beers from the hinterland’s Oswego, NY. German-born Brosomer was a relative latecomer, establishing ale brewing in Oswego in 1893 (see 100 Years of Brewing). Ames was probably giving him a boost. And Guinness was carried by Ames, too, it was everywhere in the 1800s – still is. That’s a pretty good sampling of British top-fermentation specialities for a small city like Ogdensburg. One can imagine that barroom comments assessed the local ales in relation to the imported. New York brewers often trumpeted that their beers were as good or better than Bass and other imports, but who knows. In 1878, 16 years before the above ad, J.P. Ames was selling lager too, Bartholomay’s from Rochester, NY, see here. The Cape Vincent ales mentioned must have been brewed in the locality of that name in the Thousand Islands of the region. John Ames was an English immigrant who built an enviable wine and liquors importing and wholesale business in Ogdensburg. It was operated from a four storey brick building on Isabella Street. The city’s numbering system has changed and I couldn’t find evidence the building still stands although I’d think it must. You can read biographical detail on John Ames in this trade directory. Ogdensburg, originally spelled with a terminal h, was founded by families hailing from Morristown, NJ, where Beeretseq has family as it happens. Some francophone families endured after the French era, but once the Jersey crowd came in the town assumed an old stock American aspect, which was manifest in its foodways no less than other areas of culture. The intervening British period perhaps contributed to the liking for ale and porter too, the British held forts up there until the Jay Treaty in 1794 cleared the path for settlement. It took a long time until Germanic lager largely ousted the ancestral taste for ale and porter in St. Lawrence County, although in fact lager-brewing started quite early – see once again Arnold’s book. Also, a brewer called Crichton brewed “lager bier” in Ogdensburg in the 1850s, no doubt seeking to offer an option to Arnold’s hegemony. See details on page 6 of this historical article on the city from 1965. I’d like to think Ames’ English origins inclined him to keep ale and stout going in the town including emblematic English pale ale and Irish stout. But he dealt in lager too as the 1878 ad linked above shows. In the liquor business then as now, playing favourites is a mug’s game. Note re images: The first image is my photo of the ad from the NYS digitized newspaper linked above. The second was sourced from the historical page of an Ogdensburg newspaper’s website, here. The third was sourced from this map resource site, here. All intellectual property in or to the images belongs solely to their lawful owner or authorized user. Images are believed available for educational and historical purposes. All feedback welcomed. I’d be interested in the source for that. AFAIWA the famous Potsdam conference was in occupied Germany, in July-August 1945. Also interested in the promotion of ‘Basses’, ‘Ginnesses’ and Allsopps’ ales, beers and stouts in that ad. How popular were these beers, and what sort of volumes are we talking about v. domestic beers? Noting also that you say these beers, and porter (also imported, or brewed locally?) outsold Germanic lager style beers until Prohibition. What factors do you think accounted for the change, particularly as lagers, or pilseners (if such a distinction was being made) had been brewed and available from early on. The effects of Prohibition would include, no doubt, the failure of brewers either to successfully adapt to non-alcoholic drinks, or without the financial strength to trade in such products (or others) until the end of that period, along perhaps with being brought out by larger outfits – Anheuser-Busch comes to mind. Yes, thanks for this. Slip of the tongue, I meant the village near Ogdensburg where Roosevelt met King in 1940, Heuvelton, see here. The locality is usually stated just as Ogdensburg for this purpose. I am sure volumes are available from customs records, but these would have been relatively small. Ales in general, in the country as a whole, had declined to a few percentage points when WW I began. Imports were a small part of that. In my post above, I was talking about a small area in northern New York state which had special conditions that favoured ales, based on extensive reading, until about 1914 that is. Still, on countless menus I have seen of restaurants both in the northeast and elsewhere into this period, Bass and Guinness continued to be available. They were popular imports in the general import market for ale and stout. Bass has been imported, in barrel too, since before 1850 in the U.S. as documented in my article on American Musty Ale published last year. I discuss as well other information there that suggests Bass had a reasonable footprint in the U.S. in the imports area, e.g. it had an office in NYC. This article is not available online, it is available in an issue of the journal Brewery History, available by subscription to the print issue. Many thanks for getting back to me on this. WWI would almost certainly have had an impact on export volumes – not least for prioritising supplies for domestic and military needs, reductions anyway on raw materials for brewing, and other factors. I’ll see if I can find more at this end on volumes etc.